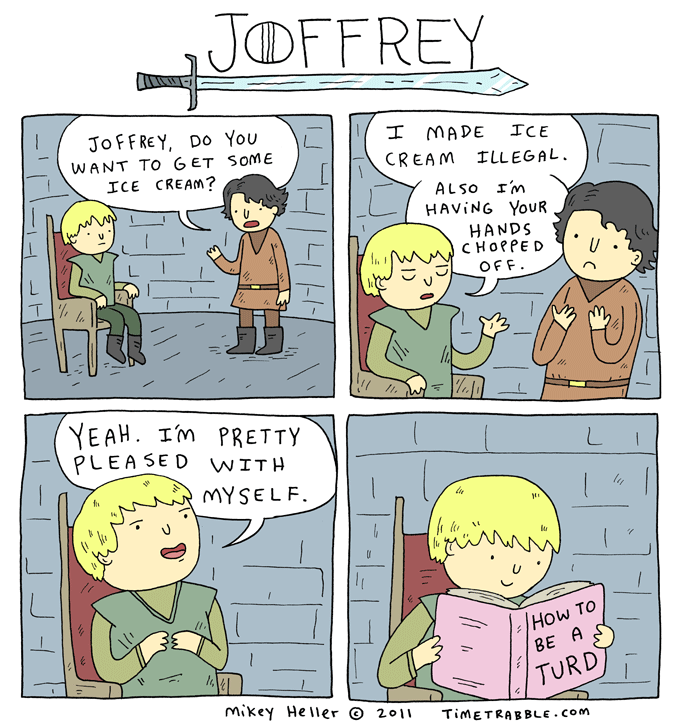 This comic is for those of you who like Game of Thrones. A pretty faithful adaptation if you ask me. This doesn’t happen in the last two episodes. But it does in the SPECIAL episode. I don’t know, man. Joffery has been a stand up guy in the series up until these last two episodes, apparently. I couldn’t even imagine anything happening that would turn him into an unlikable character! HAHA, I approve of this comic. I haven’t watched the movies, but in the books he’s a perfectly good person, along with that little bra- I mean, little Robert, Lysa’s boy and Daenerys’ older brother. Good, stout personalities all around!